Raising Children Network; Royal Children's Hospital Education Institute; Murdoch Childrens Research Institute; University of Melbourne. DNA Learning Center, Cold Spring Harbor Laboratory, New York; Royal Children's Hospital Education Institute, Melbourne. Royal Children's Hospital Education Institute, Melbourne. Royal Children's Hospital Education Institute, Melbourne; Murdoch Children's Research Institute, Melbourne. Children in hospitals are separated from their school community. Despite this, while at hospital their health and educational lives continue to be intertwined. A method to aid this connection is the use of ambient technology. In recent years, there have been developments in meeting the challenges of keeping absent children connected with their peers, learning and school community, and enhancing quality of life in an ambient-assisted world (Steg et al. 2006; Ant?n et al. 2010). Yet hospital and schools are complex and sensitive settings, and so demand deeper thinking about the design of technologies that mediate a non-disruptive connection and presence. This paper presents the use of ambient technology to help hospitalised children create a classroom presence. We present results of the use of this technology by four hospitalised children, their families, classmates and teachers. Our goal was to minimise the sense of disconnection with school experienced by the hospitalised child, and to address the 'out-of-sight, out-of-mind' attitude toward the absent child. We discuss the specific issues faced by children in hospital as part of a process to maintain a connection with their education, school community and peers. We illustrate the role of ambient and phatic technologies in mediating the hospital-classroom connection and describe the trial of an ambient orb through the case studies. We highlight the significance of this research as an exemplar of cross-sectoral collaboration between the health, education and information technology sectors. Children's health and academic achievement are closely intertwined (Forrest et al. 2011). The quality of a child's school experience relies upon a motivation to learn, security at school and a strong sense of belonging (National Research Council 2003). This sense of belonging is challenged when children are hospitalised. For some children, protracted periods of hospitalisation and repeated admissions span multiple stages of learning and critical transition points of development. Hospitalisation creates significant barriers for many of these children in terms of their continuing education, resulting in a disrupted school experience and discontinuity of learning (Wolfe 1985; Shiu 2001). This disruption places children at risk of social isolation from their school community (Martinez and Ercikan 2009), contributes to a skills deficit and impacts on their longer-term achievements and pathways (Power 2006). These barriers are partly addressed by hospital-based education programs. It is not uncommon for paediatric hospitals and larger general hospitals to house a school or employ teachers to encourage educational continuity and a culture of learning (Nisselle, Green and Scrimshaw 2011). Hospital-based educational support for children includes technologies such as email, blogs and teleconferencing, with Internet technologies contributing to a culture of learning across hospital and school settings, and providing opportunities to connect hospitalised children with their schools (Nisselle et al. 2011; Wilkie and Jones 2010). While existing communication technologies are efficient in exchanging information between the hospitalised child and the school (Wilkie and Jones 2010), challenges associated with managing health issues and hospital settings, such as vulnerability and unpredictability (Yates et al. 2010), have ramifications for the design and use of technologies in mediating the hospital-school separation. For example, a child feeling nauseous and self-conscious from chemotherapy would find a high bandwidth video connection to their classroom inappropriate. Similarly, contextual aspects of the classroom often make technologies such as email and teleconferencing inappropriate. For example, a classroom engaged in a learning activity may find text-based communication (synchronous or asynchronous) disruptive to the flow of the lesson. Thus information and communication technologies are generally not sufficiently sensitive to the context of either the classroom or the hospital. Those technologies are effective tools for exchanging information, but tend to lack adequate support to create a sense of belonging and feeling of connection between the classroom and the hospitalised child. In this paper we argue that a stronger sense of belonging can be fostered when the connection is explicitly concerned with social presence, and when the technology is more attuned to the sensitive contextual issues. Given the complex nature of issues associated with the hospital setting, we propose the use of ambient technology. Ambient technologies are characterised as being peripheral, lightweight and aesthetically pleasing (Mankoff et al. 2003). These technologies are peripheral because they do not demand attention and operate in the background to some other primary activity. They are lightweight in as much as they deal with non-critical information, and so would not be used for essential tasks such as data analysis or decision-making. They are aesthetically pleasing because they are congruent with the setting in which they are placed. Ambient technologies have much in common with 'phatic technologies' (Gibbs et al. 2005; Vetere, Smith and Gibbs 2009; Wang, Tucker and Rihll 2011). These are a class of technologies that support phatic communion (Malinowski 1949), where "speakers' relational goals supersede their commitment to factuality and instrumentality" (Coupland, Coupland and Robinson 1992, 207). Phatic technologies create the possibility for communication. They are not concerned with information exchange per se. They are primarily orientated toward establishing, maintaining and nurturing human relationships. Both ambient and phatic technologies downplay the significance of factual information exchange, and both are important in mediating the hospital-classroom connection. Ambient technologies stress the peripherality of the interaction, which is critical in the classroom setting where attention is constantly shifting between teacher, child and activity. Phatic technologies stress the social connection, which is critical to the hospitalised child. Together they help to establish a sense of belonging. To assess the response to ambient technologies across the hospital-school setting for children, their family, teachers and classmates. The technology employed in this study was a glowing orb that used mobile broadband to connect the hospitalised child with his/her classroom (Figure 1). The orb was a large light globe, shaped somewhat like a human face, containing an internal LED that allowed it to glow in different colours. The orb created ambient presence through lightweight, peripheral and aesthetically pleasing representations of colour (Mankoff et al. 2003) and phatic interactions by providing a feeling of connection without building another formal communication channel (i.e., without using text, voice or video). The orb was purposefully designed to have minimal functionality. 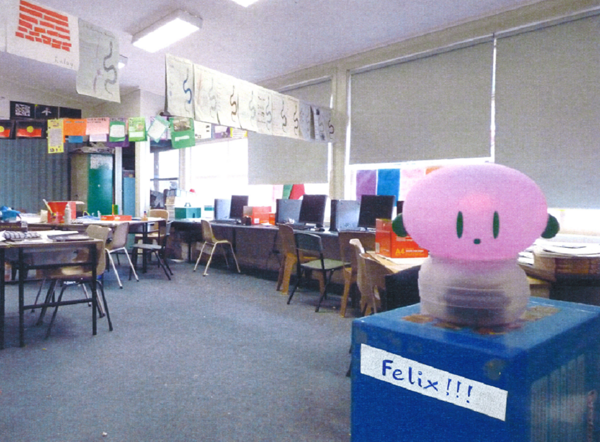 The placement of the orb in each child's classroom varied, although it was always proximal to key spaces such as the communal sitting area or whiteboard. The orb in the classroom had a wireless connection to a nearby laptop, which in turn was connected to the Internet via the 3G network. The child in hospital used a netbook computer with password-protected software to control the colour of the orb in the classroom. Through a colour-wheel interface on the netbook, the hospitalised child could remotely light up and change the colour of the orb in the classroom, thereby suggesting a sense of the child's presence into the classroom. Colour-change was the only function available to the hospitalised children. No messages or signals could be sent from the classroom. The system was administered through a web interface that allowed us to register users and collect usage log data (on/off, duration and colour). This study predominantly used qualitative techniques, which provided information on an unexplored context, such as the proof-of-concept approach of this research (Daly et al. 2007), and allowed us to interact with research participants (Willis et al. 2007). Qualitative data collection methods also enabled us to collect multiple and overlapping forms of evidence (Gillham 2005; Steel 2006) that included semi-structured interviews, observations and class group discussions. Quantitative data comprised usage log data from the web-based application. The project received approval from the relevant Human Research Ethics Committees. This study was conducted at The Royal Children's Hospital (RCH) in Melbourne, Victoria, Australia. The RCH is the major provider of paediatric health care in the state of Victoria, and oversees the admission of approximately 10,700 school-aged children (6?18 years) each year. Qualitative data from each of the participants were collected at the hospital and classroom at three times: prior to installation of the ambient orb into the classroom (to establish baseline demographics and experiences of connections with school); during the implementation and testing of the orb (to capture responses); and after installation of the orb (to assess any changes in experiences of connection with school), either immediately (parents, classmates, hospital teacher), or when the hospitalised child returned to school (hospitalised child, school teacher). Three types of data were collected: individual interviews, observations and group discussions. have sufficient competency in the English language to participate in the study (as assessed by the hospital teacher). Participants were recruited between June and August 2010. Four cases were examined. Each of the four case studies included the hospitalised child, their parents, school teacher(s), hospital teacher(s) and their classmates. The total number of participants was 114 (Table 1). The hospitalised children were aged from 9 to 11 years (Table 2). Two children were from the Melbourne metropolitan region and two from rural areas in Victoria. The children's frequency and length of admissions varied, capturing a variety of hospitalisations and length of absence from their school community. The hospitalised children continued in the study for the duration of their stay in the hospital; after-discharge contact was maintained with children until they returned to school, via their parents and school teachers. Jerry is a 9-year-old girl who has three or four hospital admissions a year, with a length of stay of about two weeks each time. While Jerry was in hospital, she thought of school and missed her friends, but did not communicate with her class. She looked forward to returning to her friends at school, but she did not really want to connect with school, or do schoolwork while in hospital. Sarah is an 11-year-old girl whose hospital admission lasted three months. While Sarah was in hospital she missed her school and thought of her friends often. She wrote letters to keep connected with her friends, and her parents set up a Facebook page to manage information flow to family, friends and classmates regarding Sarah's medical progress. Although sometimes resistant to do schoolwork while in hospital, Sarah was concerned about "falling behind". Her school principal and teachers were enthusiastic to help Sarah feel included and be part of the school. Felix is a 10-year-old boy from a regional city who had been attending the hospital weekly for almost two years. Given his one-day-per-week admission to the hospital, Felix did not feel he missed out on school or was falling behind, and brought schoolwork with him each week. However, he did miss his friends and found hospital to be a bit lonely and boring. Lucy is an 11-year-old girl from a country town who had spent 11 months at the hospital and in adjacent family accommodation. With the assistance of the hospital teacher she had stayed engaged with her learning and maintained a connection with her school, through cards from classmates and occasional SkypeTM video conference sessions. Three mothers and two fathers were interviewed before and after installation of the ambient orb. Before installation, parents reported a disconnection between their child's hospital life and their school life. While all parents referred to their children as enthusiastic learners who enjoyed school, they also reported a general lack of direct communication between the child and their school while they were in hospital. Five classroom teachers were interviewed: four usual classroom teachers and one substitute teacher. Prior to this study, two teachers had implemented some form of contact or connection with the hospitalised child. This included classmates making cards for the child to "show she's not forgotten about", and printing photos and newspaper articles about the child to display in the classroom. One teacher had visited the hospital. Six hospital teachers who had worked with the four children were also interviewed. Their ability to gauge the children's attitude to school and schoolwork, and connection with their peers, varied with the type of hospital admission, with longer admissions resulting in closer ties between the child and hospital teacher. Four classes (96 classmates) participated in orb installations, observations and post-installation group discussions. Classmates worked on curriculum-based learning during the observations. Having the orb in the classroom stimulated thought and discussion about the hospitalised child. Classmates considered what the hospitalised child might be doing, how they were feeling and what the different colours of the orb may mean (in terms of hospital activity and/or feeling). We now present the themes that emerged from cross-case analysis of the data. "I reckon it was good ... because some of my friends said when it changed colours it reminded them of me and I liked it 'cause everyone would think of me"
"She liked the idea that that would be her ... She'd sort of giggle and laugh, and go, 'I'm switching it on. They'll know I'm busy doing work!'" The feeling of "being with another" (Biocca, Harms and Burgoon 2003, 456) was important within the school setting. The classmates associated the orb with the hospitalised child, demonstrating that, despite the physical separation, the orb mediated social presence (Markopoulos et al. 2005). The changing orb colour was experienced as something like a signal, sent by the child in the hospital, to let the class know that he or she was somehow there in the classroom. The orb prompted the classmates to mention the absent children by name, and ponder the reasons for the hospitalisation. There were instances where classmates addressed the orb in the first person, as though the orb was a proxy for the absent child, pointing to the orb and greeting it, for example "Look! It's Felix!? He's there! [pointing at the orb]? He is! That's him". In this way, the orb was personalised as a social entity (Lombard and Ditton 1997) in ways that took on the identity of the absent child (Figure 2). School teachers and parents also noted the sense of the child being away but not forgotten. "It sort of gave me a sense that Felix was around". "I think it [the orb] made them [the classmates] aware ... that she's still part of the class ... They were aware of her and aware of her situation and I think that helped her coming back [to school], in my opinion anyway. But they all thought it was fantastic and it was great". "I think it [the orb] is a smart idea because it's like I'm in school, when I'm not at school, and they can know I'm thinking of them, and they can think of me. And that's good. It's a good idea". "They [the classmates] are more aware, because the orb was there ... They are thinking, 'Oh, that's Jerry. What's she doing?' ... It's good from both sides... if Jerry changed the colour, she'd be thinking, 'What are they doing in class? I'll change it to pink.'" Student 1 It's cool how it lights up and stuff and you know that Jerry's there. Student 2 It reminds us of Jerry, if, like, we forget about her? Since we haven't seen her for a long time maybe when we see that it reminds us of her, like she's here. ? Student 3 It feels like Jerry's in the classroom. Student 5 If you didn't have this [orb] you wouldn't be thinking of Jerry that much. Evident in class group discussions was the possibility that the child in hospital was changing the orb colour because he/she was missing classmates or experiencing loneliness ("I'd be pretty lonely, so I'd want to do this [changing orb colour] to connect with school") and that the orb played a role in mitigating loneliness ("If you [sic] don't have the orb, it might make her feel lonely"). This concept has been explored in other populations who are physically distant and at risk of alienation and loneliness, such as understanding emotions of distance adult learners (Kim 2011), and offers promise for future use in children's distance education settings. Researcher What do you think she was doing when the orb wasn't on? Classmate 7 She was too tired. Classmate 8 She was eating. Classmate 9 She had lots of work. Classmate 11 Getting tests done. Classmate 12 She wasn't around then. The classmates imagined an association of the different colours of the orb with different feelings or activities of the child in hospital, for example, "Blue means he's crying", "I reckon green for calm", "Orange might be a little bit hungry", "If he was feeling purple it might be lonely", "Probably asleep", "Probably needed to go and have some medication" or "Might have finished her studies". The orb was not designed to offer a faithful representation of the hospitalised child's emotional state to the classroom. Rather, this speculation of what the child in hospital might be feeling suggests that encouraging discussion about the child's likely emotional state (rather than representing the actual emotional state) can be effective in nurturing awareness. We argue that the orb's ambiguity and lack of representational fidelity was a strong motivator for awareness and presence. Similarly, ambiguity and ambience were also instrumental in helping to imagine the hospitalised child's physical setting. Classmates' questions and comments about the hospital reflected an awareness of some of the physical features of location (Benerecetti, Bouquet and Bonifacio 2001; Kostakos et al. 2005). For example, "Does she [Jerry] have a light globe [orb] at the hospital? ", "Could Felix move his arm [in the hospital]?" and perceiving having an orb whilst in hospital as being good, "instead of just lying there doing nothing". This association of ambience with place is not typically discussed in the ambience literature, suggesting scope for future exploration. The presence of an orb in the classroom and the ability to control it from within the hospital created a desire in both the hospitalised children and their classmates to initiate or escalate communication with one another. Hospitalised children expressed a desire to send emails to class teachers and classmates to stay in touch as a direct result of the orb installation. Classmate 13 ...and we were thinking when the colour changes we could go on and email her. Classmates Today ? After lunch [in technology class]. "We have to have arranged timetables to Skype? Lucy, but when she's got the orb, we don't have to [connect at the same time]". The fact that there was no exchange of messages via text, voice or video also had benefits for the hospitalised child. The technology appeared to transcend the physical details of their illness to create a feeling of being present in the classroom and a sense of togetherness (Lombard and Ditton 1997) and belonging to their social group. This was regardless of physical health and classroom activities, which is of central importance to children and young people with health conditions more broadly (Yates et al. 2010). This finding is also consistent with the benefits associated with phatic interactions that support social cohesion without relying on the content of exchanged messages. The orb had an impact on the classroom environment in subtle yet central ways, with teachers' responses to having the orb in their classroom varying. Lucy's teacher embraced the opportunity by using the orb installation to motivate classmates to think about Lucy in hospital when teaching a curriculum on emotional wellbeing, and choosing the word 'empathy' as the 'word of the day.' However, the orb was not always central to the activities of the class. Over the duration of the observations it was sometimes ignored by classmates, especially when they were absorbed in their schoolwork. We consider technology that can be appropriately ignored as a positive finding, as it would not be appropriate for the orb to have been a constant centre of attention in the classroom. The orb remained peripheral but significant, suggesting a presence but not dominance. In a learning environment, where attention is constantly shifting between teacher, child and activity, the peripherality of the interaction emerges as congruent with the classroom setting and can successfully operate in the background, secondary to other primary activities. The findings in this study clearly indicate that the ambient orb technology had an overall positive impact on the hospitalised children and also their classmates. Felix and Lucy responded enthusiastically to the experience, clearly enjoying controlling the orb and commenting about school, classmates and schoolwork in a positive light. Jerry and Sarah were a little more reserved in their reactions, not able to separate the impact of the orb experience from their overall excitement at returning to school. In all cases, 'out of sight' need not mean 'out of mind' for the hospitalised child. The positive response to ambient technology across the hospital-school setting for children, parents, teachers and classmates suggests this technology is a feasible means to mediate presence for children absent from their classrooms, for health or other reasons. To some extent, ambient technology transcended the physical details of reality. The fact that there was no formal exchange of messages between the two parties had benefits for the hospitalised child. The child would remotely change the colours of the orb in the classroom and often believe that their classmates were thinking of them regardless of what was actually happening in the classroom. Unlike other investigations of presence technologies, where the ability to interact within a mediated environment is understood to enhance presence (Lombard and Ditton 1997), the absence of a formal exchange of messages had advantages. However, we do not suggest that formal communication be replaced with ambient displays of ambiguous representations. Rather we believe the ambiguity was an important positive influence on creating a strong sense of awareness and presence and thus deserves further attention, especially examining its effects over longer periods of time. We acknowledge that four case studies of children aged 9?11 years may restrict the extent to which our findings can be generalised. While this study suggests that this ambient technology may have assisted with school re-entry by heightening presence and awareness to create a sense of connection, we are unable to report conclusively as to the effect of the technology on children's short to longer-term engagement with their mainstream learning environments. This also requires further research. The results of this investigation show the potential of ambient technology to provide benefits to children away from their school environments due to hospitalisation. The presence and awareness felt by children towards their remote classmates highlights the social impact and the significance of place in awareness systems. The ambient technology stressed peripherality and phatic interactions, which are critical in the classroom setting. Together they helped to establish a genuine sense of connection. Further work extending notions of ambient presence beyond the current study will focus on aspects of the sense of 'being together' across other primary relationships and settings for hospitalised children, such as the home environment, as well as the durability of increased presence over an extended period of time. Our research team would like to acknowledge 'Jerry,' 'Lucy,' 'Sarah' and 'Felix,' their hospital teachers, school teachers and classmates for participating in this study. We would like to thank the Institute for a Broadband Enabled Society (IBES), The University of Melbourne, for funding the research. We acknowledge the support of the Victorian Department of Education & Early Childhood Development, the National Health & Medical Research Council's Health Professional Research Fellowship and the Victorian Government's Operational Infrastructure Support Program. Ant?n, Pablo; Mu?oz, Antonio; Ma?a, Antonio; Koshutanski, Hristo. 2010. 'Security-enhanced ambient assisted living supporting school activities during hospitalisation'. Journal of Ambient Intelligence and Humanized Computing: 1?16. Benerecetti, Massimo; Bouquet, Paolo; Bonifacio, Matteo. 2001. 'Distributed context-aware systems'. Human-Computer Interaction 16 (2): 213?228. Available from: http://dx.doi.org/10.1207/S15327051HCI16234_06. Biocca, Frank; Harms, Chad; Burgoon, Judee K. 2003. 'Toward a more robust theory and measure of social presence: Review and suggested criteria'. Presence 12 (5): 456?481. Available from: http://dx.doi.org/10.1162/105474603322761270. Coupland, Justine; Coupland, Nikolas; Robinson, Jeffrey D. 1992. '"How are you? ": Negotiating phatic communion'. Language in Society 21 (2): 207?230. Daly, Jeanne; Willis, Karen; Small, Rhonda; Green, Julie; Welch, Nicky; Kealy, Michelle; Hughes, Emma. 2007. 'A hierarchy of evidence for assessing qualitative health research'. Journal of Clinical Epidemiology 60 (1): 43?49. Available from: http://dx.doi.org/10.1016/j.jclinepi.2006.03.014. Dey, Anind K; de Guzman, Edward S. 2006. 'From awareness to connectedness: The design and deployment of presence displays'. A paper presented at the CHI 2006 Conference: Awareness and Presence, Montreal, Quebec, Canada. Forrest, Christopher B; Bevans, Katherine B; Riley, Anne W; Crespo, Richard; Louis, Thomas A. 2011. 'School outcomes of children with special health care needs'. Pediatrics 128 (2): 303?312. Available from: http://dx.doi.org/10.1542/peds.2010-3347. Gibbs, Martin R; Vetere, Frank; Bunyan, Marcus; Howard, Steve. 2005. 'SynchroMate: A phatic technology for mediating intimacy'. A paper presented at the 2005 Conference on Designing for User eXperience, San Francisco, USA. Gillham, Bill. 2005. Research Interviewing: The Range of Techniques. Maidenhead, England: Open University Press. Kim, JungJoo. 2011. 'Developing an instrument to measure social presence in distance higher education'. British Journal of Educational Technology 42 (5): 763?777. Available from: http://dx.doi.org/10.1111/j.1467-8535.2010.01107.x. Kostakos, Vassilis; O'Neill, Eamonn; Little, Linda; Sillence, Elizabeth. 2005. 'Editorial: The social implications of emerging technologies'. Interacting With Computers 17 (5): 475?483. Available from: http://dx.doi.org/10.1016/j.intcom.2005.03.001. Mankoff, Jennifer; Dey, Anind K; Hsieh, Gary; Kientz, Julie; Lederer, Scott; Ames, Morgan. 2003. 'Heuristic evaluation of ambient displays'. A paper presented at the SIGCHI 2003 Conference: Human Factors in Computing Systems, New York, USA. Markopoulos, Panos; IJsselsteijn, Wijnand; Huijnen, Claire; De Ruyter, Boris. 2005. 'Sharing experiences through awareness systems in the home'. Interacting With Computers 17 (5): 506?521. Available from: http://dx.doi.org/10.1016/j.intcom.2005.03.004. Martinez, Yvonne J; Ercikan, Kadriye. 2009. 'Chronic illnesses in Canadian children: What is the effect of illness on academic achievement, and anxiety and emotional disorders?' Child: Care, Health and Development 35 (3): 391?401. Available from: http://dx.doi.org/10.1111/j.1365-2214.2008.00916.x. National Research Council, Institute of Medicine. 2003. Engaging Schools: Fostering High School Students' Motivation to Learn. Washington D.C.: The National Academies Press. Nisselle, Amy; Green, Julie; Scrimshaw, Chantel. 2011. 'Transforming children's health spaces into learning spaces'. Health Education 111 (2): 103?116. Available from: http://dx.doi.org/10.1108/09654281111108553. Nisselle, Amy; Hanns, Shaun; Green, Julie; Jones, Tony. 2011. 'Linking and learning during hospitalisation: Learning technologies connecting adolescents to school and social networks'. A paper presented at the World Conference on Educational Multimedia, Hypermedia and Telecommunications, Lisbon, Portugal. Power, Thomas J. 2006. 'Collaborative practices for managing children's chronic health needs'. In Chronic Health-Related Disorders in Children: Collaborative Medical and Psychoeducational Interventions, edited by Phelps, LeAdelle. Washington, D.C.: American Psychological Association. Available from: http://dx.doi.org/10.1037/11435-001. Shiu, Shiona. 2001. 'Issues in the education of students with chronic illness'. International Journal of Disability, Development and Education 48 (3): 269?281. Available from: http://dx.doi.org/10.1080/10349120120073412. Steel, Caroline. 2006. 'Influence of teacher beliefs on web-enhanced learning experiences: Learners and teachers'. A paper presented at the 23rd Annual Conference of the Australasian Society for Computers in Learning in Tertiary Education: Who's Learning? Whose Technology?, Sydney, Australia. Vetere, Frank; Smith, Jeremy; Gibbs, Martin. 2009. 'Phatic interactions: Being aware and feeling connected'. In Awareness Systems: Advances in Theory, Methodology and Design, edited by Markopoulos, Panos; De Ruyter, Boris; Mackay, Wendy. London: Springer. Wang, Victoria; Tucker, John V; Rihll, Tracey E. 2011. 'On phatic technologies for creating and maintaining human relationships'. Technology in Society 33 (1?2): 44?51. Available from: http://dx.doi.org/10.1016/j.techsoc.2011.03.017. Wilkie, Karina J; Jones, Anthony J. 2010. 'School ties: Keeping students with chronic illness connected to their school learning communities'. A paper presented at the International Federation for Information Processing Annual Conference: New Developments in ICT and Education, Amiens, France. Willis, Karen; Daly, Jeanne; Kealy, Michelle; Small, Rhonda; Koutroulis, Glenda; Green, Julie; Gibbs, Lisa; Thomas, Samantha. 2007. 'The essential role of social theory in qualitative public health research'. Australian and New Zealand Journal of Public Health 31 (5): 438?443. Available from: http://dx.doi.org/10.1111/j.1753-6405.2007.00115.x. Wolfe, Barbara L. 1985. 'The influence of health on school outcomes: A multivariate approach'. Medical Care 23 (10): 1127?1138. Available from: http://dx.doi.org/10.1097/00005650-198510000-00001. Yates, Lyn; Bond, Lyndal; Dixon, Mary; Drew, Sarah; Ferguson, Peter; Hay,Trevor; Moss, Julianne; St Leger, Pamela; Walker, Hannah; White, Julie. 2010. Keeping Connected: Identity, Social Connection and Education for Young People Living with Chronic Illness. Melbourne: Graduate School of Education, The University of Melbourne. Frank Vetere, Julie Green, Amy Nisselle, Xuan Thu Dang, Tsharni Zazryn, Paul Peng Deng. 2012. 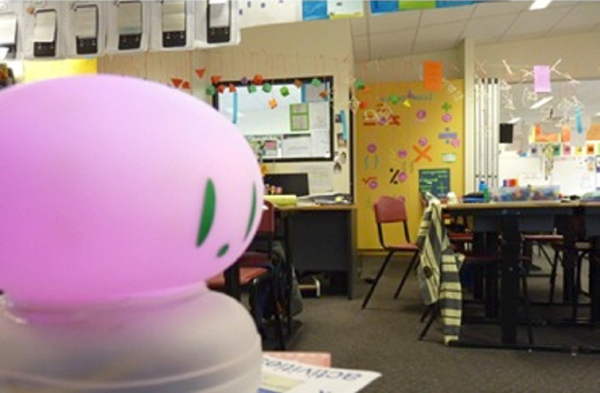 Inclusion during school absence: Using ambient technology to create a classroom presence for hospitalised children. Telecommunications Journal of Australia, Vol 62, No 5, Article 353. http://doi.org/10.7790/tja.v62i5.353. Published by the Telecommunications Society of Australia and Swinburne University.